In order to make East of Yesterday a fully immerse experience, I decided to look up some 1920s eye candy, and what better way to start than with Hollywood? Broody Rudolph sports a slicked-back look, a clean-shaven face and often, a cigarette. 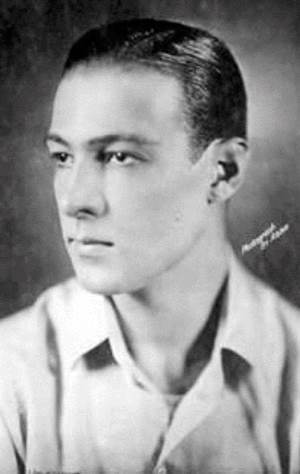 While reading his background, I learned that the only job he could hold down before becoming an actor was as a taxi-dancer, another part of 1920s pop culture that I had no idea about. Valentino led a colorful, short life. His masculinity came into question and men compared him unfavorably to Douglas Fairbanks. Men who tried to ape Valentino’s slick look were called Vaselinos. So here he is. 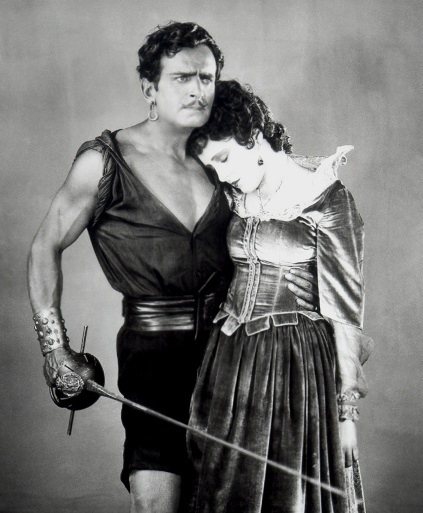 Confident and sinewy, Fairbanks played the perfect pirate, swashbuckler and superhero. If he were around today, I can see him sporting his abs. But in the 20s, biceps and pecs were apparently the thing, as they are featured in many of his pictures. I wonder if he shaved his chest for this shot. Gotta love the swooning girl. I had not heard of John Gilbert before, but he was another of Valentino’s rivals. His career spanned the 20s and the early 30s. He successfully made the transition to voice acting, but he became the victim of a producer who couldn’t stand him, and therefore fulfilled his contract with Gilbert by giving him inferior films. Gilbert made the best of it, and after a few flops, finally got good roles again. But it was too late; his career never revived, even though Greta Garbo, pictured with him here, tried to help. I think I like his look the best of the three.